Well it is with bittersweet feeling that I'm leaving Maryland this coming Monday for a new job in Utah. 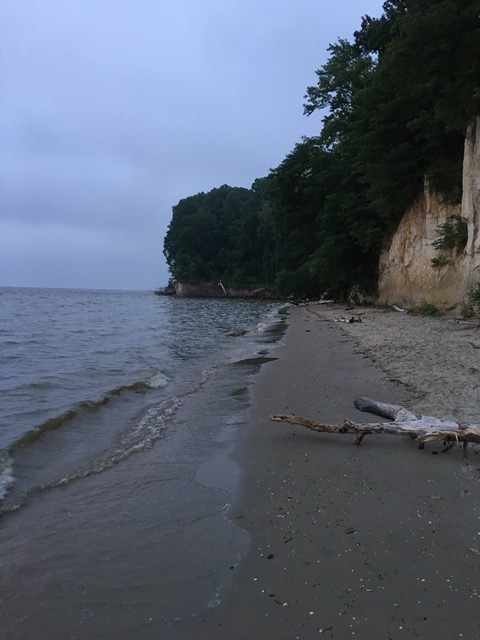 This morning at 4:45 am I hoped into my car and drove to the Cliffs one last time to say goodbye. 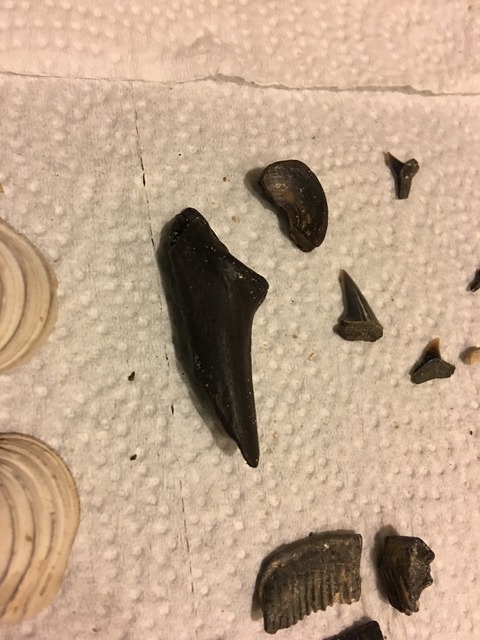 The tides were exceptionally high and I didn't do as well as last time but still had a good trip and found some stuff. A group of kids on a science trip ran into me at Mataoke cabin beach. Their guide had them gather around me as I had a hand full of Chesapecten nefrens and they were all oooohing and ahhhhing. I accidentally dropped a large tiger tooth that I found a few yards away and quickly picked it up. Their guide exclaimed, "Wow I can't believe you just found that tiger tooth!" The kids (especially the boys) at this point could care less about the large shells and where fixated on the tooth. Then they started looking all around my legs for more teeth. 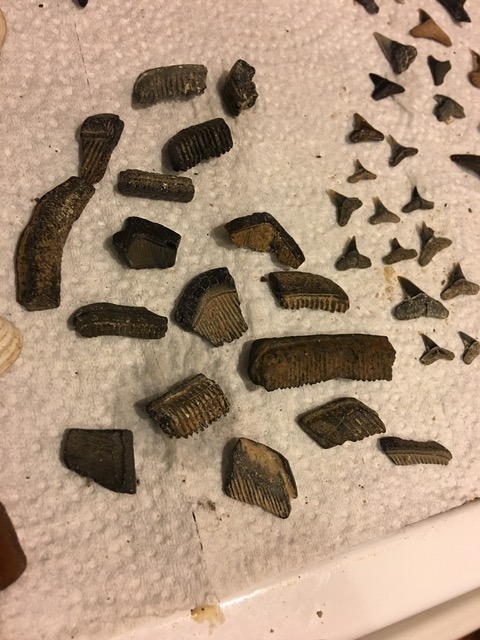 I wasn't about to tell their guide that I had found it a ways back and ruin the thrill of the moment so Injust gave everyone a coy smile and said, "Just keep looking and you're bound to find some good teeth." The truth was that was the first tooth I ever found at Mataoke and I never go their for teeth just for shells. :-) Pictures coming soon! 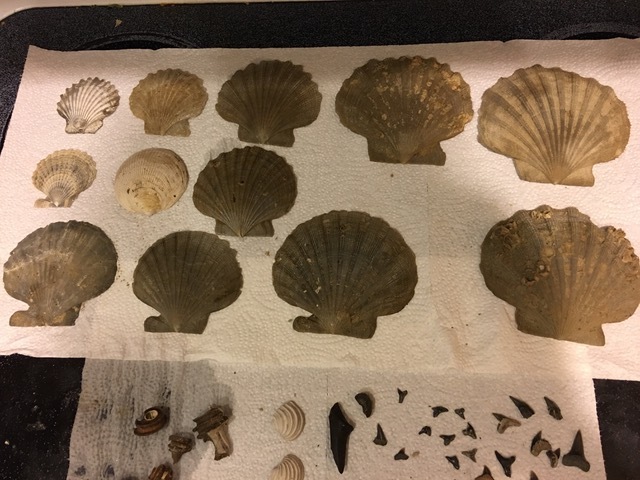 I'm not positive if these are all Chesapecten nefrens. I'll have to ID them all later but for now I'll call them C. nefrens. Some of these are matching pairs. 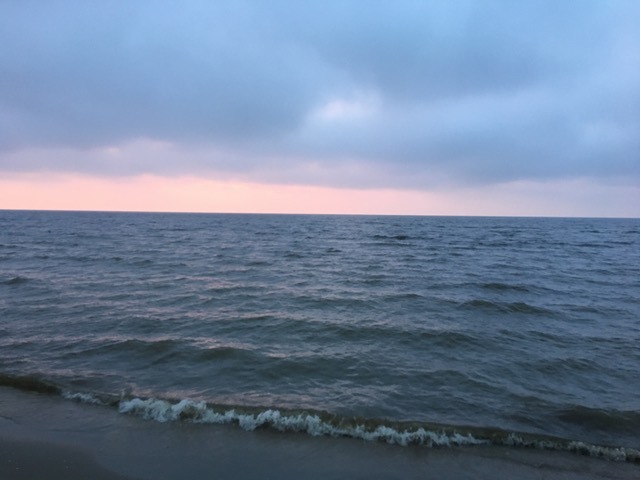 Pro-tip: If you can get to Bayfront Park by roughly 5:45 am then the Beach Patrol (teenagers with green shirts) shouldn't be there yet collecting money. This was beneficial as I didn't have to cough up $18. I just found out those over 50 can get in for $10. What gives?! Just because I'm a young man doesn't mean I should be punished for it! Ecphora popped right out of the matrix. 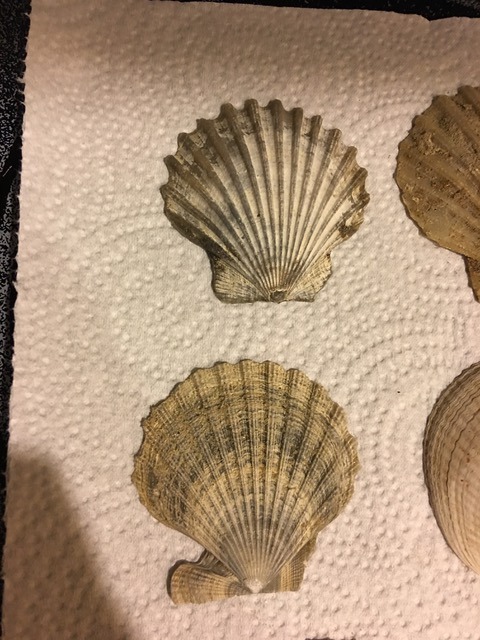 I believe this is from the St. Mary's formation because this was found in some rubble that fell from the very top of the cliffs and I know for a fact that's the St. Mary's layer. And... it's missing the bottom stem... Other than that it looks good. I'll keep it. View of a large baseball sized Ecphora. This one isn't worth extracting as that would take hours with special tools and super glue. What a heart breaker. Someday I'll find one this size that won't be so brittle. 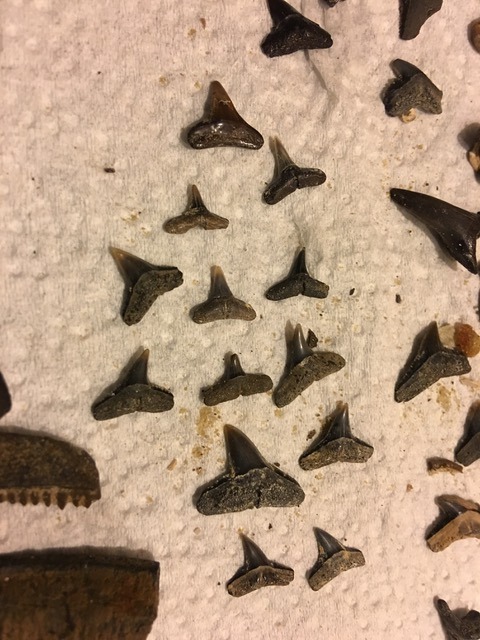 Here are a bunch of Hammer and Bonnet Head shark teeth with a few Requiem. There's an Angel shark tooth up top. I find fewer of those than cow shark teeth! Some large ray plates. The one in the middle might be the largest plate I've ever found at Bayfront. 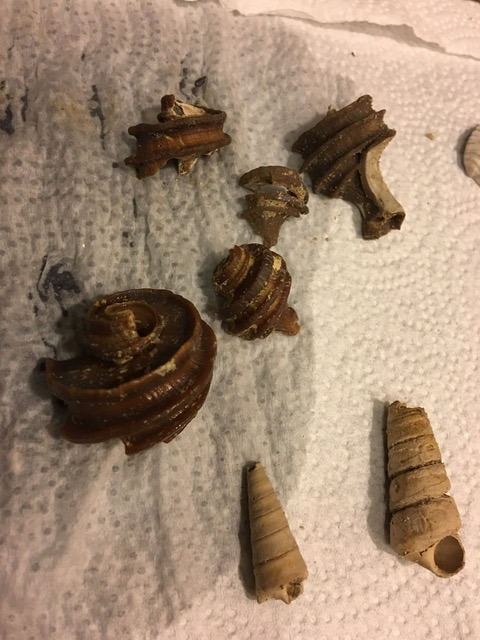 A collection of newly acquired Ecphora gardnera and Turritella. I don't usually keep bones but this one has some neat dimensions to it. Small C. nefrens are usually not kept but these have beautiful color to them. Not a bad day for Makos. 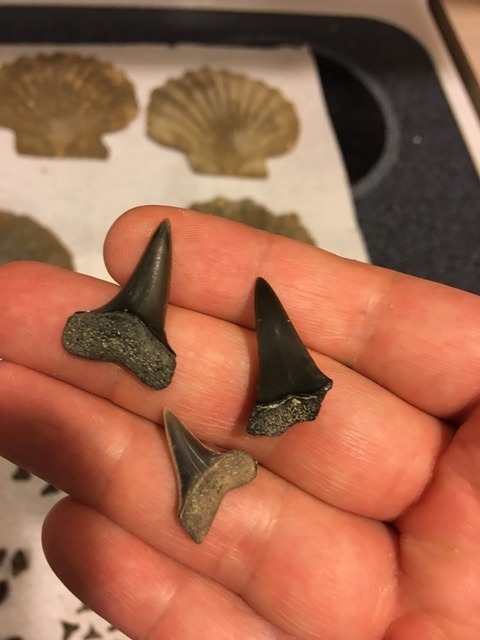 Three of my best Makos from the trip. Not my best trip but certainly not my worst either. I bid you farewell from the beautiful old line state, but look forward to your future finds in Utah! Thank you my fellow Marylander. I'll miss this place that's for sure. Hopefully I can continue to get some nice CC shark teeth via trading with you all. I will have access to some new stuff on the other side. You posted fast! See descriptions under the pictures. That St. Mary's Ecphora has a gorgeous color when wet. A light spray with matte clear acrylic will maintain that patina. I saw several large yet unfortunately broken ones around there this past Sunday. I'll need to order some of that! For my large Ecphora found a month ago I was considering using acetone to remove pieces of super glue then removing the sand because some super glue has mixed with a bit of sand and at the time I didn't want to risk breaking it. That project could keep me busy for at least 20 hours maybe more since I had to apply a lot of super glue and it was like a jigsaw puzzle. The first prep required roughly five hours of work just to clean and glue all of the tiny pieces together. After that ordeal then I'll apply some of the matte you recommended but that project is going to be a ways down the road because I have a lot to do (buy a house, new car, job, etc.). These next few months are going to be less about fossils and more about maintaining family affairs I'm afraid. Rustoleum - Clear Matte Spray Acrylic available at your local hardware store (or mega-online retailer) for less than $4 / can. When I get home I will send you photos of the Chesapectens we have that are mounted in 8 1/2" X 11" frames and hung on the wall. They are gorgeous solo or in a group, especially if you get multiple species in the evolutionary lineage. Sorry the tides werent cooperating for you today it is almost always high this time of year just makes ya shake ur head sometimes. That full bonnet ray plate is super sweet though!!!! 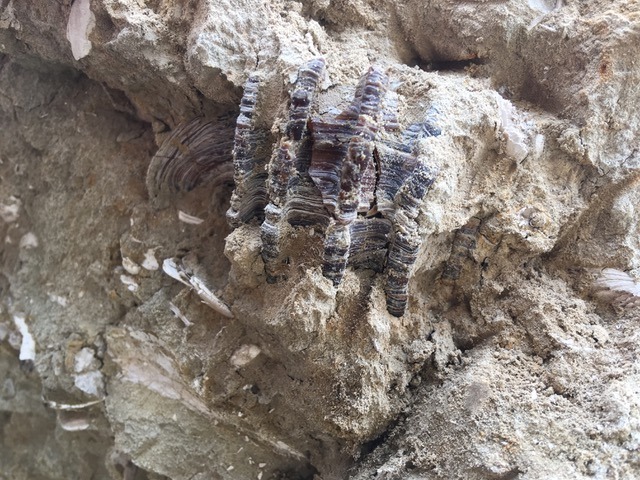 Nice finds Fossil-Hound! Good luck in Utah! Keep us posted. Sorry to see you go, I was hoping we would get a chance to meet up and go on a hunt...guess it will have to wait until Utah, my wife keeps trying to get me to go there with her since she lived there for a while and her parents are still there. 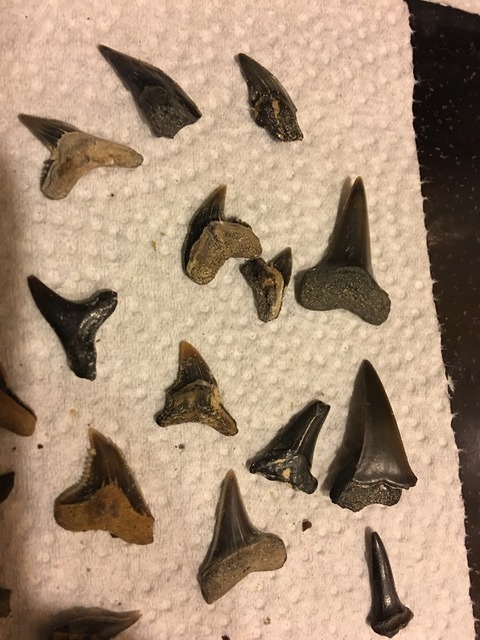 Nice finds for a finale! Have a good and safe trip to Utah, and keep Us posted to the new terrain You get to search. @RCW3D I was hoping to get all of us MD/VA guys together to do a trip to CC but alas time ran out. Let me know whenever you're going out to UT. I'm attentive to TFF so just IM me and I'll take you to some really good spots. I also know some professors of geology out there at BYU who know some really good spots so just let me know. Alright now go have fun and make me jealous by posting more from the surrounding area. Really going to miss this place. Nice finds! Like the Makos! Good luck in Utah, hope it works out for you. @Ropterus thank you sir. I'll miss you all on the east coast and will have to watch out for that renegade named @FossilDudeCO I owe him some shells and I hear he's placed a bounty on my head out west! Sorry to hear you are leaving, well at least you can expand your fossil collection in Utah. Ha, the clumsiness win was pretty cool, I hope the students found some teeth of their own and didn't just keep looking forever. 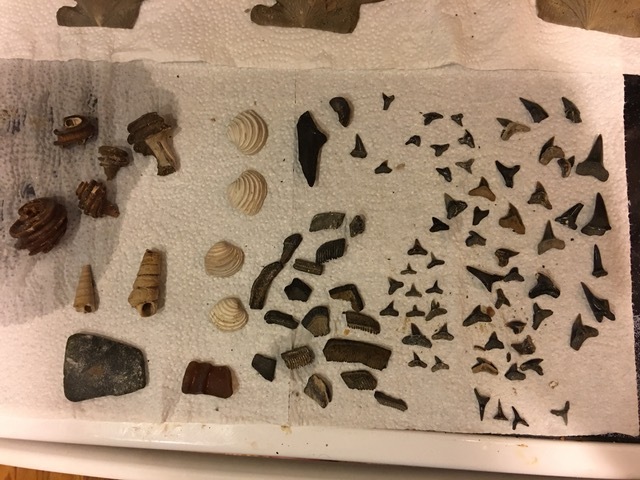 Overall, nice finds and looks like it was a fun time. Good job.